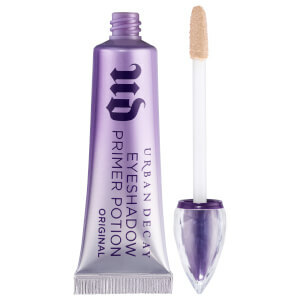 Create flawless, long-lasting eye makeup looks with Urban Decay's Travel Size Eyeshadow Primer Potion, a coveted eyeshadow primer that preps lids for smooth, vibrant, long-wearing results. 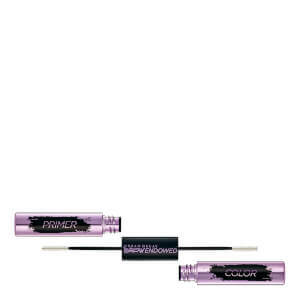 The original, universal colour blends seamlessly on all skin tones and dries with an undetectable finish. It utilises polymer technology to help ‘fill in’ imperfections on the skin's surface, paving the way for impeccable, crease-free eyeshadow application. 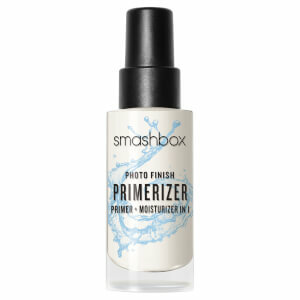 Delivering 24 hours of crease-free perfection, the travel sized primer is equipped with a flocked applicator for precision and control, and is topped with a faceted jewel-like cap. The handbag must-have is ideal for makeup mavens on-the-move. Espalhe e misture na pálpebra antes de aplicar a sombra. Isododecane, Talc, Cyclopentasiloxane, Disteardimonium Hectorite, Trimethylsiloxysilicate, Trihydroxystearin, Polyethylene, Triethylhexanoin, Hydroxystearic/Linolenic/Oleic Polyglycerides, Sorbitan Sesquioleate, VP/Eicosene Copolymer, Dimethicone, PEG-40 Stearate, Phenoxyethanol, Synthetic Beeswax, Propylene Carbonate ,Aqua (Water/Eau)., [+/- (May Contain): Mica, CI 77891 (Titanium Dioxide), CI 77491/77492/77499 (Iron Oxides), CI 77163 (Bismuth Oxychloride)]. É o único que uso e adoro este primer de sombras. É óptimo, mesmo sombras de qualidade inferior duram todo o dia com ele.